The last week January 2010, I was working at home and I saw what I thought was our beagle Zoie running through the neighbor’s yard. I immediately sprinted out the door barefoot and saw her run into our neighbor’s garage. What I found was a friendly, scared, male beagle. I brought him home and gave him food and water and he immediately was friendly with Zoie and Parker (golden retriever). He was missing teeth and was malnourished. I called the county shelter, and the nearby vet, and put the word out in the area. After a week, no one came looking for him. 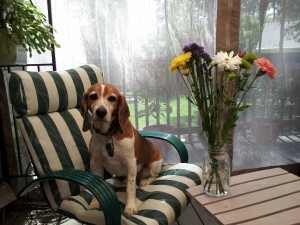 We named him Barney after my childhood book “Barney the Beagle”. July 11, 2014 – Throughout the night he had some labored breathing which continued after we got up. He skipped breakfast. We called our vet thinking he had a bug or something small. During our appointment the vet noted that his belly was bloated. She did an x-ray and then an ultrasound. They did not like what they saw, the spleen was four times its normal size. Emergency surgery. I was told that they might find something really bad and we might have to discuss putting him down depending on what was found. Shock, he was perfectly fine one day earlier. I drove to pick up my wife and bring her back to say goodbye right before they started surgery. After about 20 minutes, a vet tech and came out and said the spleen had ruptured and he had lost a lot of blood. They were not sure why there was a rupture. Because of the blood loss, a transfusion might be necessary – just four hours after surgery we drove 45 minutes to VRCC for the transfusion, weekend critical care and observation. We felt very lucky. Barney would not have survived the day without the judgment and expertise of a team of regional vets. July 17, 2014 – Our vet called – the biopsy of the spleen showed lymphoma. As tears ran down our faces, Dr. Waite at The Oncology Service at Dogwood Vet Hospital was recommended. Barney is now into his fourth week of chemo treatment. It is going good, he is playful, and Dr. Waite is happy with his progress. He has gained back the weight he lost due to the surgery/recovery plus two pounds. Over the weekend someone in area was setting off fireworks – Barney gave a very animated and booming bay, it was a great night. Update: Sadly, Barney lost his battle to cancer in August of 2015. His owner wrote that they were so grateful to have 13 extra months with him and that throughout that whole time he only had 5 or 6 bad days, with four of those being in the last week of his life.